Chuck Bender began seriously woodworking at the age of 12 in his parents’ basement making pieces of furniture for friends and family. He studied under Werner Duerr at the Central Chester County Vocational Technical School (now called the Center for the Arts and Technology) in Pennsylvania throughout high school. Werner taught his high school program exactly like his apprenticeship in Germany. The students were taught to blend hand-tool use with power-tool use. Chuck holds to that same philosophy today. 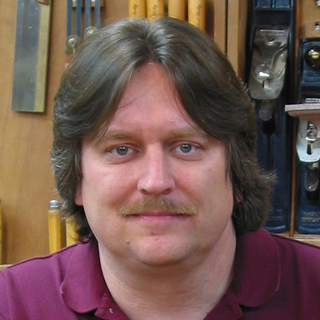 After graduating from high school, Chuck worked with other cabinetmakers in order to hone his skills. After striking out on his own in 1991, he has continued to build a reputation for making the highest quality 18th Century furniture in the country. His work can be seen in museums, private collections and at some of the finest juried craft shows in the country; and has received numerous awards and appeared in a multitude of articles published locally and nationally. In 2007, Chuck added the title “woodworking mentor” to his list of accomplishments by starting a school, the Acanthus Workshop (now, an online woodworking education website). In the years since he has been published in national woodworking magazines and content driven websites. With a growing list of more than a dozen DVDs published, Chuck continues to educate budding (and accomplished) woodworkers across the worldwide.